Just as the rumors indicated, Microsoft is bringing video from a number of providers beyond the ones it initially announced to the Xbox 360 in its fall update, including big guns like Verizon and Comcast. While Verizon is promising "a selection" of its live TV channels on the Xbox 360 as expected, Comcast is only bringing its Xfinity TV video on-demand offerings (no AnyPlay powered live TV -- yet) to subscribers when it launches "in the coming months." Other notable providers include Lovefilm (UK, Germany), BBC TV (UK), HBO Go, and Syfy. As promised during E3, the services integrated with Xbox will offer support for search across all available video, as well as support for Kinect voice and gesture controls. The universal search is looking good since it pulls together various services into one UI (as we discussed on our podcast yesterday), but the reality is content providers and geographical limits on what services you can pick from are still throwing up walls between users and content. Check after the break for PR detailing what you'll be able to access and where, as well as a video intro to all the tasty new TV services. Today we are happy to announce plans to roll out the next generation of TV entertainment on Xbox LIVE. We have nearly 40 world class TV and entertainment providers coming to Xbox LIVE including: Bravo, Comcast, HBO GO, Verizon FiOS and Syfy in the U.S.; BBC TV and radio in the U.K.; Telefónica in Spain; Rogers On Demand in Canada; Televisa in Mexico; ZDF in Germany; and MediaSet in Italy, that will begin rolling out to consoles in more than 20 countries this holiday. Microsoft and LOVEFiLM, Europe's largest subscription service – streaming movies and TV episodes over the Internet and sending DVDs by post – have today announced a partnership that will make LOVEFiLM part of the next generation of TV entertainment, bringing the service to millions of Xbox 360 users across the UK and Germany. The agreement between the two leading home entertainment companies sees LOVEFiLM become an official Xbox LIVE integrated film service provider and is the next step in LOVEFiLM's strategy for multi-platform delivery – already offering streaming on the LOVEFiLM Player, through the PC, iPad®, in-home connected living room devices, PlayStation®3 and, now, Xbox 360. UK and German LOVEFiLM members will be able to instantly stream thousands of titles from major studios and independents, in addition to exclusive movies such as the global phenomenon The Twilight Saga, Unknown, starring Liam Neeson and thriller Source Code, starring Jake Gyllenhaal. With Kinect for Xbox 360, user interaction will be made more personal and intuitive, with the ability to effortlessly control the LOVEFiLM Player App through motion, gestures and voice commands. This interactivity will revolutionise the way film fans manage their movie selection and engage with LOVEFiLM. We are pleased to announce this partnership as both parties really focus on giving customers exciting and innovative services. We are proud to be a part of Microsoft's expansion into the entertainment space and confident it will help fuel our ambition to become Europe's largest membership entertainment service." "Microsoft is very excited to be welcoming LOVEFiLM to Xbox LIVE. I feel certain that the opportunity to interact with LOVEFiLM's amazing catalogue of studio and independent film releases using Kinect-enabled voice and gesture commands will be well received by Xbox owners here in the UK." Members will be able to scroll through titles on the page, search through categories including 'Pick of the Week', 'Most Watched' and 'Highest Rated', view ratings and search through the LOVEFiLM instant offering by title, actor and genre. In a little over seven years, LOVEFiLM has become a leading European film subscription service, combining the benefits of DVD rental by post and, more recently, watching movies online via the LOVEFiLM Player (on the PC, the PlayStation®3, iPad and streamed direct to TV). Customers choose from a selection of over 70,000 titles available across Blu-ray, DVDs, video games and digital streaming. LOVEFiLM currently has 1.7 million members and operates in the UK, Germany, Sweden, Denmark, and Norway. In February 2011 LOVEFiLM was acquired by Amazon EU SARL. Xbox 360 is a premier home entertainment and video game system. Thanks to the addition of Kinect, Xbox 360 has transformed social gaming and entertainment with a whole new way to play - no controller required. Xbox 360 is also home to the best and broadest games as well as the largest on-demand library of music, standard- and high-definition movies, TV shows and digital games, all in one place. The entertainment center of the living room, Xbox 360 blends unbeatable content with a leading social entertainment network of nearly 35 million Xbox LIVE members to create a limitless entertainment experience that can be shared at home or across the globe. More information about Xbox 360 can be found online at http://www.xbox.com. Xbox LIVE is the online entertainment service for your Xbox 360, connecting you to an ever-expanding world of games, movies, TV, music, sports and social entertainment. Xbox LIVE lets you play the best games, enjoy one of the world's largest on-demand libraries on any console, listen to millions of songs and share the fun with friends around the world. Xbox LIVE is also the exclusive home of controller-free online entertainment through Kinect, making your Xbox 360 more intuitive and interactive than ever before. With an active ecommunity of nearly 35 million people across 35 countries, Xbox LIVE, together with Xbox 360, provides you with instant access to the entertainment you want, shared with the people you care about, wherever you are. More information about Xbox LIVE can be found online at http://www.xbox.com/live. NEW YORK and REDMOND, Wash., Oct. 5, 2011 /PRNewswire/ -- Verizon and Microsoft Corp. today announced an agreement that will open the door to a new FiOS TV-powered entertainment experience for the Xbox 360 video game and entertainment system. Using a Verizon-developed software application, FiOS TV and Internet customers who are also Xbox LIVE Gold members will be able to view popular live TV channels through their Xbox consoles without any extra hardware required. This holiday, Verizon will bring a selection of popular live TV channels to Xbox 360 and will be a leader in delivering live, multichannel streaming HD TV, integrated with Kinect, via the Xbox. The new collaboration is an important expansion of the breadth of entertainment available on Xbox 360 and the latest move by Verizon to break down old technology barriers and provide customers the freedom of a borderless lifestyle where they can connect with what they love on all their favorite devices. Utilizing Kinect for Xbox 360, FiOS customers will be able to easily discover and enjoy content in extraordinary new ways, all without having to pick up a remote control. Verizon's vision for the future – the Borderless Lifestyle – can be summed up in four words: anytime, anywhere, any device. "We want to make everything our customers want or need to do, easier and more convenient, by putting the power of our technology in their hands – through the Internet-connected devices they use every day," said Eric Bruno, vice president of consumer and mass business product management for Verizon. "The Borderless Lifestyle is about erasing old technology boundaries and freeing consumers to enjoy entertainment on their own terms. FiOS TV on the Xbox 360 will tap into the magic of Kinect to transform the way people interact with TV, providing a game-changing entertainment experience for our customers." AT&T, BBC, Comcast, HBO, Rogers, Telefónica, Televisa and Verizon are among providers rolling out new TV entertainment services on Xbox LIVE. REDMOND, Wash. - Oct. 5, 2011 - A new era in television begins this holiday where your entertainment becomes instantly searchable, easily discoverable and enjoyable in extraordinary new ways from a single device - Xbox 360. Today, Microsoft Corp. announced plans to roll out the next generation of TV entertainment on Xbox LIVE, the online entertainment service for Xbox 360. Nearly 40 world-leading TV and entertainment providers, including Bravo, Comcast, HBO GO, Verizon FiOS and Syfy in the U.S.; BBC in the U.K., Telefónica in Spain; Rogers On Demand in Canada; Televisa in Mexico; ZDF in Germany; and MediaSet in Italy, will begin rolling out entertainment services to the console this holiday, in more than 20 countries. "Today's announcement is a major step toward realizing our vision to bring you all the entertainment you want, shared with the people you care about, made easy," said Don Mattrick, president of the Interactive Entertainment Business at Microsoft. "Combining the world's leading TV and entertainment providers with the power of Kinect for Xbox 360* and the intelligence of Bing voice search will make TV and entertainment more personal, social and effortless." "We are continually evolving the television experience to bring Xfinity TV subscribers more personalized ways to search, find and watch the content they love," said Sam Schwartz, president of Comcast Converged Products. "Our recently launched next-generation Xfinity TV platform is enabling us to bring Xfinity On Demand to a gaming console for the first time, and Kinect's voice and gesture controls will offer our customers an innovative way to discover and enjoy Xfinity On Demand's huge library of top shows and movies." Xbox 360 brings all your entertainment, friends and family together in one place. Now, easily switch from playing your favorite game with a friend out of state or even across the world to watching your favorite TV show with your family members on the same couch, all through Xbox LIVE. Ready to mix things up? Effortlessly switch from games to music to live TV and more, simply by telling your Xbox what you want to experience. "Microsoft and Verizon share a common vision to transform the ways people enjoy and interact with the entertainment they want - what Verizon calls the borderless lifestyle," said Eric Bruno, vice president of consumer and mass business product management for Verizon. "FiOS TV on the Xbox 360 is an excellent example of how we're working with market leaders to erase old technology borders to expand the FiOS TV experience and taking advantage of unique new features including voice- and gesture-control of live TV entertainment via Kinect. This holiday, Verizon will bring a selection of popular live TV channels to Xbox 360 and will be a leader in delivering live, multichannel streaming HD TV, integrated with Kinect, via Xbox." Xbox LIVE now has a unified dashboard for greater, easier navigation, whether customers use Kinect or a controller. Access more entertainment content for everyone in the family from numerous providers, and enjoy on-demand or live programming. Xbox 360 is the first console to offer access to the world's greatest TV properties, including BBC, Channel 4, Channel 5 and LOVEFiLM in the U.K.; Antena 3, RTVE and Telefónica in Spain; Televisa in Mexico; and Bravo, Comcast's Xfinity On Demand service, Crackle, EPIX, Syfy, TMZ, "The Today Show," UFC, Verizon FiOS and HBO GO in the United States. "We have been thrilled with the success of HBO GO. Our ongoing goal is to deliver HBO's acclaimed programming to our subscribers wherever and whenever they want it, and this relationship with Microsoft is another huge step in accomplishing just that," said Bernadette Aulestia, senior vice president, Domestic Network Distribution & Marketing, HBO. "HBO GO on Xbox is also a marriage of two pre-eminent brands - both with a reputation for delivering the highest quality of entertainment." These new TV and video providers announced today join our existing lineup of great TV and video entertainment partners already on Xbox 360 - AT&T, Netflix and Hulu+ in the U.S., TELUS in Canada, BSkyB in the U.K., Canal+ in France, Vodafone Portugal, VimpelCom in Russia, and FOXTEL in Australia. 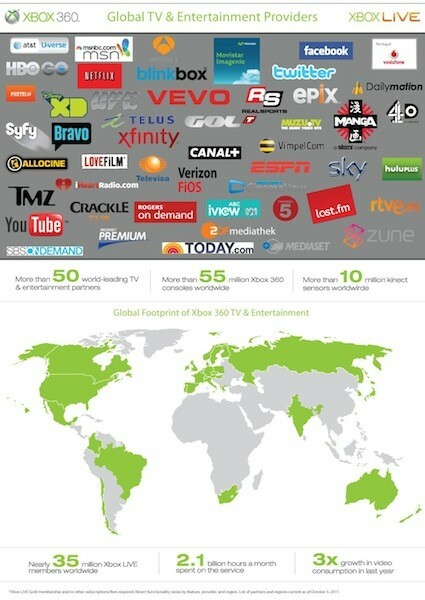 "Nearly a year ago, AT&T U-verse became the first TV provider in the U.S. to launch live TV on Xbox 360. Now we look forward to working with Microsoft to deliver even more innovative features that will allow U-verse TV customers to use voice and gesture controls to manage their TV experience," said Jeff Weber, vice president of video services, AT&T Mobility and Consumer Markets. "Through our Microsoft partnership, AT&T U-verse TV has been a leader in delivering a multiscreen and interactive TV experience that offers customers more personalization, more control and more integration across devices, all on the industry's only 100 percent IPTV platform." Sports aren't just a game on Xbox 360. With live and on-demand content from ESPN in the U.S., UFC in the U.S. and Canada, GolTV in Spain and Maple Leaf Sports & Entertainment/Real Sports in Canada, Xbox 360 completely changes how sports fans experience and interact with their favorite pastimes. The all-new ESPN on Xbox LIVE features thousands of live events and video highlights with enhanced personalization features, split-screen viewing and an updated interface content guide that makes it easy for fans to find the highlights from the teams and sports they care most about. UFC on Xbox LIVE gives fans access to live pre-event videos, a catalog of on-demand video, an Interactive Fight Card and pay-per-view events in stunning HD all together in one place. The energy of the Octagon is coming right into the living room. In addition to adding the world's largest TV providers and the best names in sports, the biggest names in Web video, news and music are also coming to Xbox 360, including AlloCiné, Dailymotion, iHeartRadio, MSN with MSNBC.com, "The Today Show," TMZ, VEVO and YouTube. Whether catching up on the Web's latest viral videos, watching breaking news, sports and weather, listening to your favorite music, or sitting down to enjoy your favorite games, movies or TV shows - no other entertainment device brings it all together in one place like Xbox 360. With Kinect for Xbox 360, there are no remotes, no buttons, no worries. Consumers will prefer to experience entertainment on Xbox 360 because it allows them to easily search and discover content across multiple entertainment providers within Xbox LIVE and interact and enjoy that content in extraordinary new ways. Gone are the days of managing a handful of remote controls, trying to remember what movies are available from what service, and hunting back and forth across television inputs. Using voice search with Bing on Xbox, easily look across a variety of branded services and play the programming you want without ever raising a finger. Having trouble finding last night's episode of "The Office"? It's now only a voice command away. Just say "Xbox, Bing, 'The Office,' " and Xbox finds it. Not only is entertainment effortless on Xbox 360, it is more social and personal. Everything in Xbox has been designed to share with friends. Share recommendations, and show the Xbox LIVE community what games you're playing, movies you're watching and music you're listening to, as well as invite them to join in - even post your game achievements and info about your favorite movies directly to your Facebook wall from Xbox LIVE. It's simple: With your social network along for the ride, the world's leading content providers and the magic of Kinect, entertainment experiences are better on Xbox LIVE.